At the time of the Abbasid Caliphate, such methods of cooking rice at first spread through a vast territory from Spain to Afghanistan, and eventually to a wider world. The Spanish paella,[note 5] and the South Asian pilau or pulao,[note 6] and biryani,[note 7] evolved from such dishes. According to the Oxford English Dictionary, Third Edition (2006) the English word pilaf, which is the later and North American English form of spelling the word pilau, is a borrowing from Turkish, its etymon, or linguistic ancestor, the Turkish pilav, whose etymon is the Persian pilāv; "pilaf" is found more commonly in North American dictionaries than pilau. The British and Commonwealth English spelling, pilau, has etymon Persian pulaw (in form palāv , pilāv , or pulāv in the 16th century), whose line of descent is: Hindi pulāv (dish of rice and meat), Sanskrit pulāka (ball of rice), which in turn is probably of Dravidian descent (in the modern Dravidian language Tamil puḷukku means (adjective) simmered, (noun) boiled or parboiled food, puḷukkal cooked rice). Although the cultivation of rice had spread much earlier from South Asia to Central and West Asia, it was at the time of the Abbasid Caliphate that methods of cooking rice which approximate modern styles of cooking the pilaf at first spread through a vast territory from Spain to Afghanistan, and eventually to a wider world. The Spanish paella,[note 8] and the South Asian pilau or pulao,[note 9] and biryani,[note 10] evolved from such dishes. According to author K. T. Achaya, the Indian epic Mahabharata mentions an instance of rice and meat cooked together. Also, according to Achaya, "pulao" or "pallao" is used to refer to a rice dish in ancient Sanskrit works such as the Yājñavalkya Smṛti. However, according food writers Colleen Taylor Sen and Charles Perry, and social theorist Ashis Nandy, these references do not substantially correlate to the commonly used meaning and history implied in pilafs, which appear in Indian accounts after the medieval Central Asian Muslim invasions in northern India. Similarly Alexander the Great and his army have been reported to be so impressed with Bactrian and Sogdian pilavs that his soldiers brought the recipes back to Macedonia when they returned. Similar stories exist of Alexander introducing pilaf to Samarkand; however, they are considered apocryphal by art historian John Boardman. The earliest documented recipe for pilaf comes from the tenth-century Persian scholar Avicenna (Ibn Sīnā), who in his books on medical sciences dedicated a whole section to preparing various dishes, including several types of pilaf. In doing so, he described the advantages and disadvantages of every item used for preparing the dish. Accordingly, Persians consider Ibn Sina to be the "father" of modern pilaf. Thirteenth-century Arab texts describe the consistency of pilaf that the grains should be plump and somewhat firm to resemble peppercorns with no mushiness, and each grain should be separate with no clumping. Another primary source for pilaf dishes comes from the 17th-century Iranian philosopher Molla Sadra. Some cooks prefer to use basmati because it is easier to prepare a pilaf where the grains stay "light, fluffy and separate" with this type of rice. However, other types of long-grain rice are also used. The rice is rinsed thoroughly before use to remove the starch. Pilaf can be cooked in water or stock. Common additions include fried onions and fragrant spices like cardamom, bay leaves and cinnamon. Pilaf is usually made with meat or vegetables, but it can also be made plain which is called sade pilav in Turkish, chelo in Farsi and ruzz mufalfal in Arabic. On special occasions saffron may be used to give the rice a yellow color. Pilaf is often made by adding the rice to hot fat and stirring briefly before adding the cooking liquid. The fat used varies from recipe to recipe. Cooking methods vary with respect to details such as pre-soaking the rice and steaming after boiling. There are thousands of variations of pilaf made with rice or other grains like bulgur. In Central Asia there are plov, pilau on the Indian subcontinent, and variations from Turkmenistan and Turkey. Some include different combinations of meats, fruits or vegetables, while others are simple and served plain. In the present day, Central Asian, Indian, Turkish cuisine, Iranian and Caribbean cuisine are considered the five major schools of pilaf. In Afghan cuisine, Kabuli palaw or qabili palaw (Dari : قابلی پلو ) is made by cooking basmati with mutton, lamb, beef or chicken, and oil. Kabuli Palaw is cooked in large shallow and thick dishes. Fried sliced carrots and raisins are added. Chopped nuts like pistachios, walnuts, or almonds may be added as well. The meat is covered by the rice or buried in the middle of the dish. The Kabuli Palaw rice with carrots and raisins is very popular in Saudi Arabia, where it is known as roz Bukhari (Arabic: رز بخاري), meaning Bukharan rice. Armenians use a lot of bulgur (cracked wheat) in their pilaf dishes. Armenian recipes may combine vermicelli or orzo with rice cooked in stock seasoned with mint, parsley and allspice. One traditional Armenian pilaf is made with the same noodle rice mixture cooked in stock with raisins, almonds and allspice. Armenian kinds of rice are discussed by Rose Baboian in her cookbook from 1964 which includes recipes for different pilafs, most rooted in her birthplace of Aintab in Turkey. Baboian recommends that the noodles be stir-fried first in chicken fat before being added to the pilaf. Another Armenian cookbook written by Vağinag Pürad recommends to render poultry fat in the oven with red pepper until the fat mixture turns a red color before using the strained fat to prepare pilaf. Lapa is an Armenian word with several meanings one of which is a "watery boiled rice, thick rice soup, mush" and lepe which refers to various rice dishes differing by region. Antranig Azhderian describes Armenian pilaf as "dish resembling porridge". Azerbaijani cuisine includes more than 40 different plov recipes. One of the most reputed dishes is plov from saffron-covered rice, served with various herbs and greens, a combination distinctive from Uzbek plovs. Traditional Azerbaijani plov consists of three distinct components, served simultaneously but on separate platters: rice (warm, never hot), gara (fried meat, dried fruits, eggs, or fish prepared as an accompaniment to rice), and aromatic herbs. Rice is not mixed with the other components even when eating plov. In Bangladesh, Pulao (পোলাও), Fulao, Holao or Fulab, is a popular dish cooked with rice and meat (chicken or mutton or beef). Pulao is a rice dish, cooked in seasoned broth with rice, meat and spices. A pulao is often complimented with raita. The rice is made in mutton or beef or chicken stock and an array of spices including: coriander seeds, cumin, cardamom, cloves and others. 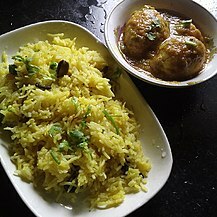 The Morog Pulao in the division of Dhaka is prepared with chicken. It is prepared in marriage ceremonies, condolence meetings, and other occasions. It is often complimented with borhani. A significantly modified version of the recipe, often seen as influenced by what is called arroz pilau there, is known in Brazil as arroz de frango desfiado or incorrectly risoto de frango (Portuguese: [aˈʁoʒ dʒi ˈfɾɐ̃gu dʒisfiˈadu], "shredded chicken rice", [ʁiˈzotu], "chicken risotto"). Rice lightly fried (and optionally seasoned), salted and cooked until soft (but neither soupy nor sticky) in either water or chicken stock is added to chicken stock, onions and sometimes cubed bell peppers (cooked in the stock), shredded chicken breast, green peas, tomato sauce, shoyu, and optionally vegetables (e.g. canned sweet corn, cooked carrot cubes, courgette cubes, broccolini flowers, chopped broccoli or broccolini stalks/leaves fried in garlic seasoning) and/or herbs (e.g. mint, like in canja) to form a distantly risotto-like dish – but it is generally fluffy (depending on the texture of the rice being added), as generally, once all ingredients are mixed, it is not left to cook longer than 5 minutes. In the case shredded chicken breast is not added, with the rice being instead served alongside chicken and sauce suprême, it is known as arroz suprême de frango (Portuguese: [ɐˈʁo s(ː)uˈpɾẽm(i) dʒi ˈfɾɐ̃gu], "chicken supreme rice"). In the Eastern Caribbean and other Caribbean territories there are variations of pelau which include a wide range of ingredients such as pigeon peas, green peas, string beans, corn, carrots, pumpkin, and meat such as beef or chicken, or cured pig tail. The seasoned meat is usually cooked in a stew, with the rice and other vegetables added afterwards. Coconut milk and spices are also key additions in some islands. Trinidad is recognized for its pelau, a layered rice with meats and vegetables. It is a mix of traditional African cuisine and "New World" ingredients like ketchup. The process of browning the meat (usually chicken, but also stew beef or lamb) in sugar is an African technique. In Tobago pelau is commonly made with crab. Central Asian, e.g. Tajik and Uzbek plov (Tajik: палав, Uzbek: palov) or osh differs from other preparations in that rice is not steamed, but instead simmered in a rich stew of meat and vegetables called zirvak, until all the liquid is absorbed into the rice. A limited degree of steaming is commonly achieved by covering the pot. It is usually cooked in a kazan (or deghi) over an open fire. The cooking tradition includes many regional and occasional variations. Commonly, it is prepared with lamb, browned in lamb fat or oil, and then stewed with fried onions, garlic and carrots. Chicken plov is rare but found in traditional recipes originating in Bukhara. Plov is usually spiced with whole black cumin, coriander, barberries, red pepper, marigold, and pepper. Heads of garlic and garbanzo beans are buried into the rice during cooking. Sweet variations with dried apricots, cranberries and raisins are prepared on special occasions. Although often prepared at home for family and guests by the head of household or the housewife, plov is made on special occasions by the oshpaz (osh master chef), who cooks the national dish over an open flame, sometimes serving up to 1,000 people from a single cauldron on holidays or occasions such as weddings. Oshi nahor, or "morning plov", is served in the early morning (between 6 and 9 am) to large gatherings of guests, typically as part of an ongoing wedding celebration. The Uzbek-style plov cooking recipes are spread nowadays throughout all post-Soviet countries and Xinjiang Uyghur Autonomous Region of China. In the Greek cuisine, piláfi (πιλάφι) is the fluffy and soft, but neither soupy nor sticky, rice that has been boiled in a meat stock or bouillon broth. In Northern Greece, it is considered poor form to prepare piláfi on a stovetop; the pot is properly placed in the oven. Gamopílafo ("wedding pilaf") is the prized pilaf served traditionally at weddings and major celebrations in Crete: rice is boiled in lamb or goat broth, then finished with lemon juice. Gamopílafo though it bears the name is not a pilaf but rather a kind of risotto, with creamy and not fluffy texture. Pulao is usually associated with Moghul cuisine. The dish consists of rice and a mixture of either lentils or vegetables, mainly including peas, potatoes, french beans, carrots or meat, mainly chicken, fish, lamb, pork or prawn. There are very elaborate pulaos with Persianized names like hazar pasand ("a thousand delights"). It is usually served on special occasions and weddings, though it is not uncommon to eat it for a regular lunch or dinner meal. It is considered very high in food energy and fat. A pulao is often complemented with either spiced yogurt or raita. Persian culinary terms referring to rice preparation are numerous and have found their way into the neighbouring languages: polo (rice cooked in broth while the grains remain separate, straining the half cooked rice before adding the broth and then "brewing"), chelo (white rice with separate grains), kateh (sticky rice) and tajine (slow cooked rice, vegetables, and meat cooked in a specially designed dish also called a tajine). There are also varieties of different rice dishes with vegetables and herbs which are very popular among Iranians. Chelo: rice that is carefully prepared through soaking and parboiling, at which point the water is drained and the rice is steamed. This method results in an exceptionally fluffy rice with the grains separated and not sticky; it also results in a golden rice crust at the bottom of the pot called tahdig (literally "bottom of the pot"). Polo: rice that is cooked exactly the same as chelo, with the exception that after draining the rice, other ingredients are layered with the rice, and they are then steamed together. In Pakistan, Pulao (پلاؤ) is a popular dish cooked with Basmati rice and meat (chicken or mutton or beef). Pulao is a rice dish, cooked in seasoned broth with rice, meat and spices. A pulao is often complimented with raita. The rice is made in mutton or beef or chicken stock and an array of spices including: coriander seeds, cumin, cardamom, cloves and others. Mutton and beef have, with time, been replaced with chicken due to higher prices of mutton. The Sindhi pulao (Sindhi: سنڌي پُلاءُ‎) in the province of Sindh, prepared with mutton or beef or chicken. It is prepared by Sindhi people of Pakistan in their marriage ceremonies, condolence meetings, and other occasions. Traditional Levantine cooking includes a variety of Pilaf known as "Maqlubeh", known across the countries of the Eastern Mediterranean. The rice pilaf which is traditionally cooked with meats, eggplants, tomatoes, potatoes, and cauliflower also has a fish variety known as "Sayyadiyeh", or the Fishermen's Dish. Historically, mutton stock was the most common cooking liquid for Turkish pilafs, which according to 19th century American sources was called pirinç. Turkish cuisine contains many different pilaf types and is the inspiration behind most of the variations in Armenia, Balkans, Greece, and Arab countries due to their past under Ottoman Empire rule. Some of these variations are pirinc (rice) pilaf, bulgur pilaf, and arpa şehriye (orzo) pilaf. Using mainly these three types, Turkish people make many dishes such as perdeli pilav, and etli pilav (rice cooked with cubed beef). Unlike Chinese rice, if Turkish rice is sticky, it is considered unsuccessful. To make the best rice according to Turkish people, one must rinse the rice, cook in butter, then add the water and let it sit until it soaks all the water. This results in a pilaf that is not sticky and every single rice grain falls off of the spoon separately. ^ a b c Oxford English Dictionary 2006b. ^ a b Merriam-Webster Unabridged Dictionary 2019. ^ a b Perry 2014, p. 624. ^ a b Roger 2000, p. 1144. ^ a b c d Roger 2000, p. 1143. ^ a b c d Nandy 2004, p. 11. ^ a b c d Sengupta 2014, p. 74. ^ Oxford English Dictionary 2006a. ^ Sen, Colleen Taylor (2014), Feasts and Fasts: A History of Food in India, Reaktion Books, pp. 164–5, ISBN 978-1-78023-391-8 Quote: "(pp. 164–165) "Descriptions of the basic technique appear in thirteenth-century Arab cookbooks, although the name pulao is not used. The word itself is medieval Farsi, and the dish may have been created in the early sixteenth century at the Safavid court in Persia. ... Although dishes combining rice, meat and spices were prepared in ancient times, the technique of first sautéing the rice in ghee and then cooking it slowly to keep the grains separate probably came later with the Mughals." ^ Perry, Charles (December 15, 1994), "Annual Cookbook Issue : BOOK REVIEW : An Armchair Guide to the Indian Table : INDIAN FOOD: A Historical Companion By K. T. Achaya (Oxford University Press: 1994; $35; 290 pp. )", Los Angeles Times Quote: "The other flaw is more serious. Achaya has clearly read a lot about Indian food, but it was in what historians call secondary sources. In other words, he's mostly reporting what other people have concluded from the primary evidence. Rarely, if ever, does he go to the original data to verify their conclusions. This is a dangerous practice, particularly in India, because certain Indian scholars like to claim that everything in the world originated in India a long time ago. ... Achaya even invents one or two myths of his own. He says there is evidence that south Indians were making pilaf 2,000 years ago, but if you look up the book he footnotes, you find that the Old Tamil word pulavu had nothing to do with pilaf. It meant raw meat or fish." ^ Nandy, Ashis (2004), "The Changing Popular Culture of Indian Food: Preliminary Notes", South Asia Research, 24 (1): 9–19, CiteSeerX 10.1.1.830.7136, doi:10.1177/0262728004042760, ISSN 0262-7280 Quote: " (p. 11) Not merely ingredients came to the subcontinent, but also recipes. ... All around India one finds preparations that came originally from outside South Asia. Kebabs came from West and Central Asia and underwent radical metamorphosis in the hot and dusty plains of India. So did biryani and pulao, two rice preparations, usually with meat. Without them, ceremonial dining in many parts of India, Pakistan, and Bangladesh is incomplete. Even the term pulao or pilav seems to have come from Arabic and Persian. It is true that in Sanskrit — in the Yajnavalkya Smriti — and in old Tamil, the term pulao occurs (Achaya, 1998b: 11), but it is also true that biryani and pulao today carry mainly the stamp of the Mughal times and its Persianized high culture. ^ a b Nabhan, Gary Paul (2014). Cumin, Camels, and Caravans: A Spice Odyssey. University of California Press. ISBN 9780520267206. ^ Boardman 2019, p. 102. ^ a b c d e "How to cook perfect pilaf". The Guardian. 2012-09-26. ^ Algat, Ayla (2013-07-30). Classical Turkish Cooking: Traditional Turkish Food for the America. HarperCollins. ISBN 9780062039118. ^ Davidson 2014, p. 624. ^ Perry, Charles (1992-04-28). "Rice Pilaf: Ingredients, Texture Varies". Sun Sentinel. ^ Davidson, Alan (2006). The Oxford Companion to Food. Oxford University Press. doi:10.1093/acref/9780192806819.001.0001. ISBN 978-0-19-280681-9. Retrieved 2018-07-16. ^ "Recipe for Armenian-style rice pilaf with vermicelli, peas, and herbs". Boston Globe. 2014-01-14. ^ "Armenian Rice Pilaf With Raisins and Almonds". New York Times. ^ From Ajem Pilaf to Yalanchi Dolma: Armenian Cookbooks Added to Janice Bluestein Longone Culinary Archive. University of Michigan Library. ^ Dankoff, Robert (1995). Armenian Loanwords in Turkish. Otto Harrassowitz Verlag. p. 53. ISBN 978-3-447-03640-5. ^ Azhderian, Antranig (1898). The Turk and the Land of Haig; Or, Turkey and Armenia: Descriptive, Historical, and Picturesque. Mershon Company. pp. 171–172. ^ Interview with Jabar Mamedov Archived 2008-12-21 at the Wayback Machine, Head Chef at the "Shirvan Shah" Azerbaijani restaurant in Kiev, 31 January 2005. ^ a b Ganeshram, Ramin (2005-10-31). Sweet Hands: Island Cooking from Trinidad & Tobago. Hippocrene Books. ISBN 9780781811255. ^ a b Cite error: The named reference Davidson2014 was invoked but never defined (see the help page). ^ Reejhsinghani, Aroona (2004). Essential Sindhi Cookbook. Penguin Books India. p. 237. ISBN 9780143032014. Retrieved 22 August 2015. ^ Reejhsinghani, Aroona (2013-07-25). The Sindhi Kitchen. ISBN 9789383260171. Retrieved 22 August 2015. ^ "Good Housekeeping". 18. 1894. ^ Oxford English Dictionary (subscription requied): "A dish, partly of Middle Eastern, partly and ultimately of South Asian origin, consisting of rice (or, in certain areas, wheat) cooked in stock with spices, usually mixed with meat and various other ingredients. ^ Merriam-Webster Unabridged Dictionary (subscription required): "rice usually combined with meat and vegetables, fried in oil, steamed in stock, and seasoned with any of numerous herbs (as saffron or curry)." ^ Perry: "A Middle-Eastern method of cooking rice so that every grain remains separate. ...However, there is no evidence that rice was cooked by this technique in India before the Muslim invasions, and Indians themselves associate pilaf-making with Muslim cities such as Hyderabad, Lucknow, and Delhi. .... The first descriptions of the pilaf technique appear in the 13th-century Arabic books Kitab al-Tabikh and Kitab al-Witsla ila al Habib, written in Baghdad and Syria, respectively. They show the technique in its entirety, including the cloth beneath the lid, and describe still-current flavourings such as meat, pulses, and fruit. ^ Roger: "As noted, Iranians have a unique method of preparing rice. This method is designed to leave the grains separate and tasty, making the rice fluffy and very flavorful. After soaking, parboiling, and draining, the rice is poured into a dish smeared with melted butter. The lid is then sealed tightly with a cloth and a paste of flour and water. The last stage is to steam it on low heat for about half an hour, after which the rice is removed and fluffed." ^ Roger: " (p. 1143) Under the Abbassids, for example (ninth to twelfth century), during the Golden Age of Islam, there was one single empire from Afghanistan to Spain and the North of Arabia. The size of the empire allowed many foods to spread throughout the Middle East. From India, rice went to Syria, Iraq, and Iran, and eventually, it became known and cultivated all the way to Spain. .... Many dishes of that period are still prepared today with ingredients available to the common people. Some of these are vinegar preserves, roasted meat, and cooked livers, which could be bought in the streets, eaten in the shops, or taken home. Such dishes considerably influenced medieval European and Indian cookery; for example, paella, which evolved from pulao, and pilaf and meat patties that started out as samosa or sambusak." ^ Nandy: "(p. 11) All around India one finds preparations that came originally from outside South Asia. Kebabs came from West and Central Asia and underwent radical metamorphosis in the hot and dusty plains of India. So did biryani and pulao, two rice preparations, usually with meat. Without them, ceremonial dining in many parts of India, Pakistan, and Bangladesh is incomplete." ^ Sengupta: "(p. 74) Muslim influence on the style and substance of Indian food was profound. K.T. Achaya writes that the Muslims imported a new refinement and a courtly etiquette of both group and individual dining into the austere dining ambience of Hindu society. ... Babur's son, Humayun, came back to India after spending a long period of exile in Kabul and the Safavid imperial court in Iran. He brought with him an entourage of Persian cooks who introduced the rich and elaborate rice cookery of the Safavid courts to India, combining Indian spices and Persian arts into a rich fusion that became the iconic dish of Islamic South Asian cuisine, the biryani." This page was last edited on 16 April 2019, at 01:41 (UTC).